This document explains the steps for Crystal reports in Pinnacle. Anyone with Pinnacle access can run Crystal reports. Click Search to bring up a list of all Crystal reports. Note:If you know part of the report name, enter it into the Name field. By default, 15 results display per page. You can change how many results display per page, up to 250. Click Search after changing any search criteria. Click the Name of the report you would like to run. 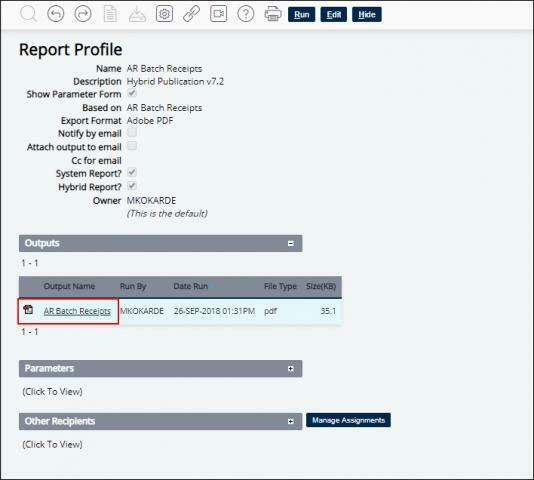 Click Run to bring up the report profile and parameters windows and run the report. Note:In the Report Profile window, you can choose to have the report sent by email. Enter the parameters for running the report. Note:Output Name should be entered and uniquely identify this run of the report (Report Name, Run Date). The other report parameters change depending on the report being run. ImportantThe report appears in the output section. Click the Output Name PDF to view the report. The report example below is a PDF file. Hover near the bottom of the page to display the PDF toolbar, which allows you to print.